1. Major DeBeers - "The South African is a man after my own heart. He hates minorities, children, old people, and puppies. The classic old-school heel. The Major's philosophy of cheating is better than losing is a creed most people can, and should, live by." 2. 'The German Beef' Otto Schwanz - "This big German has the most potential of anyone I've ever managed. He's big, mean, and insane, all qualities I look for in a wrestlers. His only downfall is his sort attention span. Otto can cause Otto problems." 3. Boris Dragoff - "The Russian Hit Man has been a cornerstone of the Brotherhood. He left us for awhile to try being a fan favorite but realized that he needed my evil genius to guide him." 4. Frank 'The Tank' Parker - "My favorite American wrestler. This guy also has tons of potential. He's big and strong and as mean in the ring as anyone I've ever managed. If this were 1976 he'd be a big star in one of the territories." "Iran - NUMBER VON! Count Grog - NUMBER VON! USA? HOCH! PTOO!" 5. 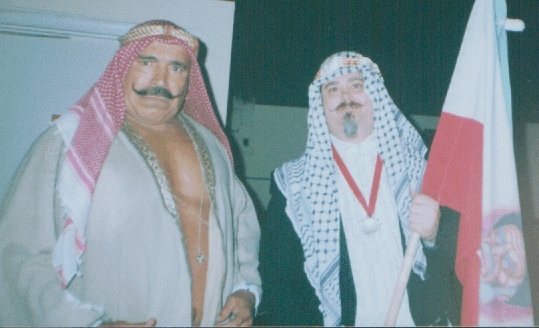 The Iron Sheik - "The former WWF World Champion is always a pleasure to be around. This guy is nothing but class. Plus when managing the Sheik, he supplies you with quality headgear." 6. 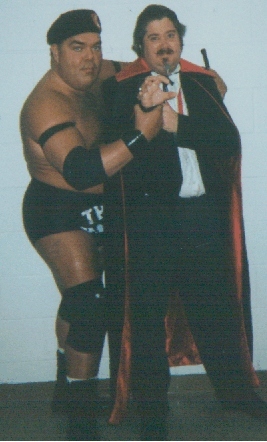 Roger Anderson - "Frank Parker's tag partner. Another wrestler so full of potential...it's amazing he's not in the WWF or WCW." 7. Tracy Smothers - "Before he was in the Full Blooded Italians, he was in the Brotherhood. A true veteran who can wrestle, brawl, and make a fine canoli." 8. KC Thunder - "Indy wrestling's pretty boy. KC is not only a fine wrestling talent, but also the best in-ring dancer in the business. Disco Inferno eat your heart out!" 9. Cueball Carmichael - "I have only had a few chances to manage Cueball, but it's always a pleasure. Old-school heels are my forte I guess. Only wish he came down to SCW more often." 10. 'Nature Boy' Buddy Landell - "Buddy is a true showman. Another old-time heel who knows how to get a crowd going. Had I been in his corner in 1986, Buddy would've been NWA World Champion."